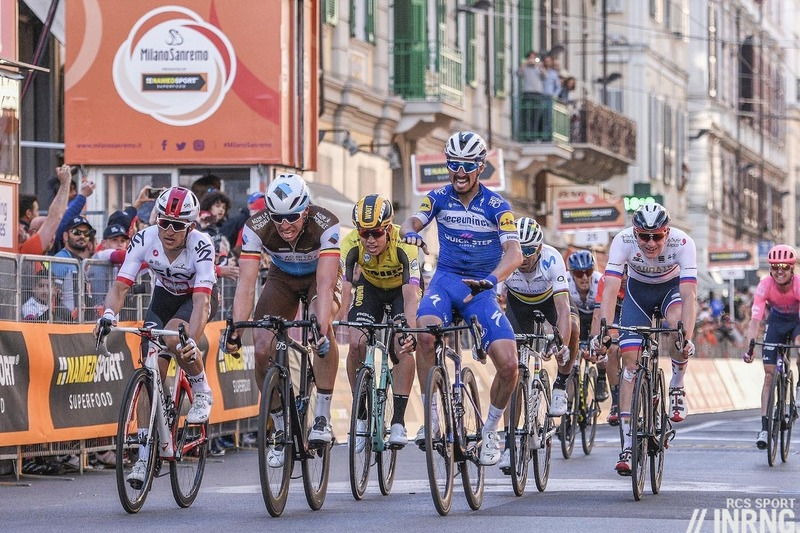 Was the winning moment when Julian Alaphilippe attacked on the Poggio to go clear with a small group of riders and eliminating the threat of a bunch sprint, or when he launched his sprint from the group that reached Sanremo? It was a commanding performance and from here the sprint seems more crucial for just as Alaphilippe jumps, Peter Sagan is languishing too far back. 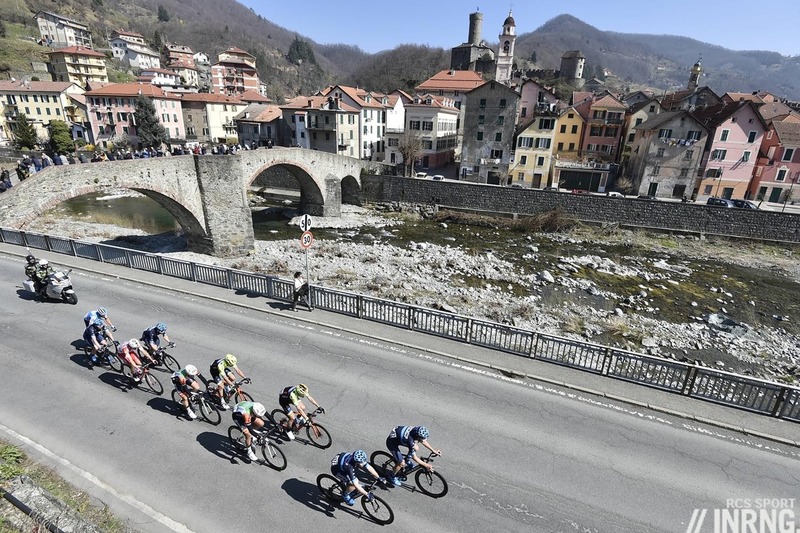 Spring had reached Milan and the riders enjoyed gentle conditions at the start. The early break went and no big team placed a rider up front. Novo Nordisk did get four of their riders. They’re know they’re not going to come first but in the longest race on the calendar showing their diabetic riders can handle 300km is probably the best message they can send out. Lotto-Soudal, Bora-Hansgrohe, Deceuninck-Quickstep and UAE led the chase with Direct Energie visible too, they kept the break close. As the breakaway reached the final of the three capes Androni’s Fausto Masnada led alone. He just made it to the Cipressa alone, over 260km covered and two paragraphs worth of blog. The Cipressa didn’t supply much to write home about either. It’s becoming a self-fulling prophecy that since no move has stuck for over 20 years it’s not worth trying but this needn’t be true, it may not deliver a win but it can disrupt the sprinters. Dylan Groenewegen and Nacer Bouhanni lost a few metres but that was about as disruptive as it got. The descent saw Niccolò Bonifazio challenge the race motos as he carved his way downhill like a Super-G skier in Sölden. It was impressive bordering on wild, you hesitated between wondering who his tire sponsor is and whether he’d land in the same olive tree as Jan Raas in 1984. Back on the via Aurelia and Bonifazio built up a 20 second lead but the effort was showing and suddenly he was swamped by the peloton. Julian Alaphilippe’s attack on the Poggio was telegraphed in advance, but when. Was it when he declared Milan-Sanremo was his early season target? When he won the Strade Bianche? The two stage wins in Tirreno-Adriatico. You could see Peter Sagan and Greg Van Avermaet bumping shoulders as they jostled to get on his wheel in the approach to the Poggio. 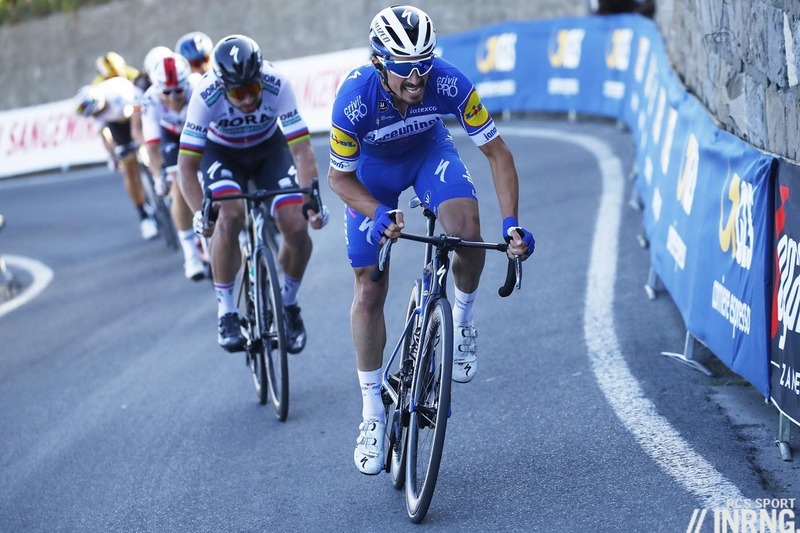 Deceuninck-Quickstep set the pace up the Poggio, heightening the inevitability of an Alaphilippe attack, first Zdeněk Štybar then Philippe Gilbert acting as booster rockets to send Alaphilippe into orbit. EF Education First’s Alberto Bettiol was the first to jump and he opened up a gap, then Alaphilppe launched and surged past. Kwiatkowski led the chase with Peter Sagan on his wheel to recreate the 2016 podium in the race but they were joined by Matteo Trentin, Wout Van Aert, Oliver Naesen and Alejandro Valverde and the group had a 12 second lead as they embarked on the descent. 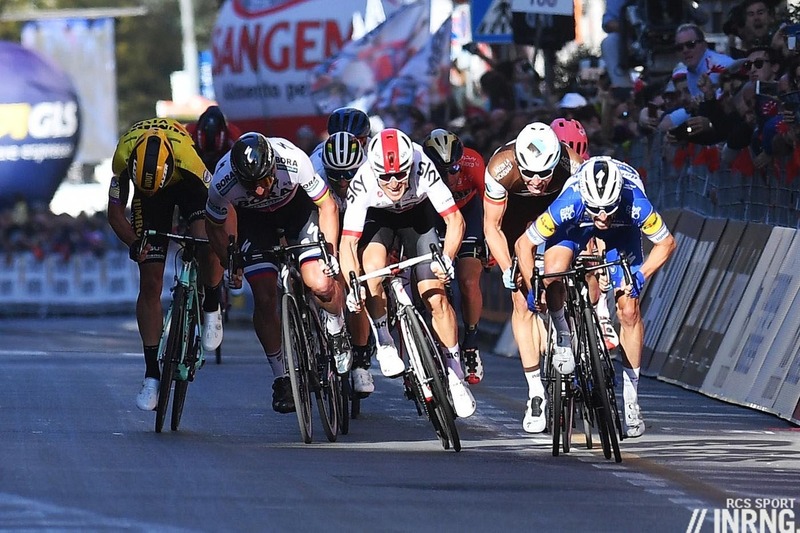 After a warp-speed climb – apparently a new record which requires further analysis – the descent was calmer and riders began to get across to form a group of 11 riders by the time they rode into Sanremo including Vincenzo Nibali. Trentin attacked, a surprise given his sprint but he got a gap until Van Aert bridged across with the rest in two. Watch the sprint in slow motion and Sagan almost resembles a traffic island, he seemed immobile as the others parted around him, he didn’t want to lead out but the hesitation saw him swamped and he was suddenly seventh wheel. He’s never been a fine tactician, with his power he hasn’t needed to be and perhaps he’s still a touch short of form and so less lucid in the finish. Matej Mohorič led and then Alaphilippe jumped with over 200m to go. For a second it looked like Naesen was going to get past but the Frenchman was on top of a huge gear and had time to sit up and celebrate before the line. Late action. The early breakaway was as menacing as a mushroom risotto, and the Cipressa might as well have been flat but if it doesn’t offer spectacle, it’s not redundant as it compounds the fatigue. All this relative inaction just heightened the tension for the Poggio where the dimming sunlight and shadows, as well as the TV production, can make it hard to see what is happening as things move so fast. It made for a mesmerising final 12 minutes: the time between the start of the Poggio and the finish… it felt like five minutes. Alaphilippe wins as predicted: a Poggio attack and then winning the sprint from a small group but there was never a moment of inevitability. His attack saw him swamped by some big names including Sagan and Trentin who were rivals for the sprint, and with a kilometre to go he didn’t seem an obvious winner in a sprint alongside Peter Sagan, nor with 100 metres to go as Naesen closed in. It might feel like the latest in a regular series for Alaphilippe who does make it look easy. But this is his biggest by far, over and above the Tour de France stages and the Flèche Wallonne. The podium feels satisfying with Oliver Naesen getting a surprise second place but a deserved result and previous winner Michał Kwiatkowski. Peter Sagan just misses out, again, it’s his third fourth place in Sanremo, the first goes way back to 2012 and if he seemed to be the fastest in the final 200 metres it’s proof of how elusive the race can be. Thank you for your coverage, insightful and entertaining to read! Dumoulin got back to the group, showing good form already in a race like this. Although you’d expect him to be there with his hardness and ability to climb. I do wonder, should he have waited for Matthews? I’m sure he and Matthews are asking this question as well. Matthews wasn’t far off, Dumoulin couldn’t do anything in the final approach. On the Poggio they were together… until it exploded. Would Matthews have been able to spring for the win or podium if he waited and then paced the two of them to the lead group? Hard to say for Dumoulin and Matthews, they looked to be chasing together for a moment but then the camera went elsewhere. Superficially it’s good to see them both in the mix, Dumoulin not where we might expect him and Matthews so close after a problematic start to the season but both probably won’t be so cheerful about it. Great analysis. Amateur hour from Sagan tactically in the finale. He was in 3rd place on Alaphilippe’s wheel with a few hundred meters to go after Mohoric went – the perfect place to be – and then suddenly he got outmanouvred again and found himself at the front. From then on it was race over for him, he hesitated too long and was unable to launch his sprint in time. Great end of the race and what a top 10 it was! Naesen seems in great form (remember his 2nd place in the final stage of Paris-Nice) and I expect him to be a force to be reckoned with the cobbled classics. It wouldn’t surprise me if he wins big this year. If ever there’s an afterlife I think today I had a fleeting glimpse of a cycling Valhalla – Niccolo Bonifazio’s precision descent off the Cipressa to the sun-kissed coast in the closing stages of a Milan – Sanremo. The corners sliced finer than a prosciutto ham. Completely agree with Inner Ring’s analysis too. Fabulous race. That descent was terrifying to watch. A masterpiece. Pity it didn’t yield more of a reward. What about the technique of steering from the top of the bars! Even more nerve wracking to watch than the supertuck. Agree on Naesen. Tactics, why did Van Aert tow up the break to Trentin? If no one does then they all lose. If he goes maybe others don’t and he has more of a chance. When Degenkolb dropped his chain over the top of the Poggio, was he chasing on to the attack or dropped from the main group? So much going on I couldn’t work out where he was. I could tell he was pissed off though! Chasing Mathews with Nibali. Dumolin was further down the road. leason learned Nibaly went downhill way faster than Mathews. According to Kwiatkowski’s strava profile he clocked 5:41 for the Poggio ascend at a mindblowing speed of 38,3 kmh for a 4% climb. This breaks the record from 1995 set by Fondriest and Jalabert. As a parent of a now young adult son with Type 1 diabetes (since age 3), I applaud team Novo Nordisk. Diabetic supplies/medicine is not something that users generally comparison shop – therefore, the advertising benefit of the team for Novo Nordisk in an increased revenue sense is limited. The good will it engenders though amongst people familiar with the disease is huge. There is a misconception that diabetics are unfit and overweight. It stems from confusing Type 1 (generally autoimmune triggered in youth) with Type 2 (highly correlated to age, weight and lifestyle). The distinction is lost on most people. But to those of us familiar with the distinction, it is important. There is nothing a Type 1 athlete cannot do. A matter of logistics, conditioning and heart…just like any other athlete. Bravo Novo Nordisk, great race. Was delighted to see, and also (Eurosport) doing a good job of explaining the monitoring patches they have and readers they keep in their jersey pockets. My brother has a similar set up, alas the NHS does not pay for the ‘Bluetooth style’ semi permanent pins. Hopefully one day. Was delighted they got their air time, good on RCS for having them in the race and good on the riders and team for a strong showing. My heart rate during the last 10km is about as high as when I rode the climb myself, a truly thrilling race every year. http://www.climbing-records.com/2019/03/fastest-poggio-ascent-since-1995-record.html is claiming second fastest on record, 4s slower than 1995 but 5s faster than 2017 and 1s faster than 1998. 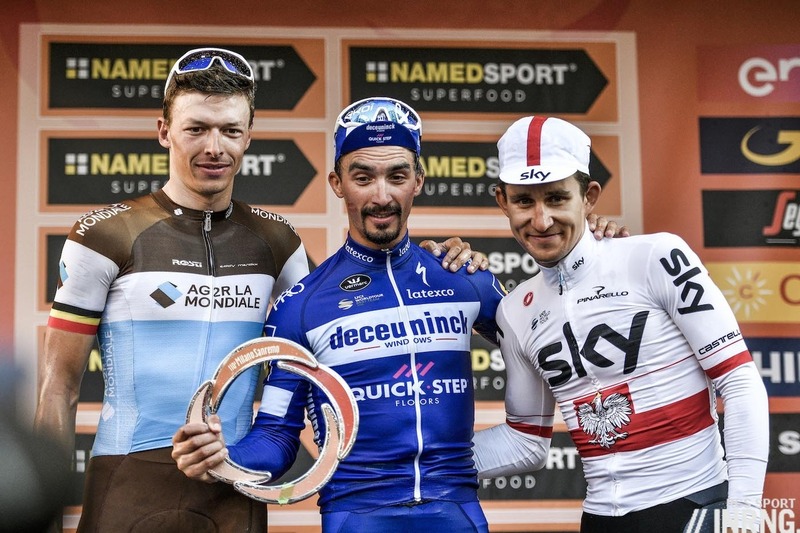 Alaphilippe has improved his tactics and is now thinking about his racing well, unlike Sagan who messed up a sprint in MSR for the third time. It seemed like over-confidence when he launched to early against Ciolek and Kwaitkowski, this just seemed like he was more concerned about others not taking advantage of him. Maybe I’m being unfair and wouldn’t say it about others, but he seems to need to focus his thoughts more on the race and less on his own self-image. Poor tactics too from Trentin who, just as he did a few years ago in a similar situation in this race, tried a highly speculative attack in the final 2km – why not rely on your sprint when you’re one of the fastest people there? If you told me Alaphilippe beat all those riders in a sprint I wouldn’t believe it until I saw it. And he initiated the winning move. He’s obviously still getting stronger. Surely he’s in the Sagan / Valverde pantheon now. I’m also surprised that Wout van Aert and Naesen were there. It’s going to be a great classics season. Also, DQS still forgetting how to lose. What a great race and a classy podium – obviously a lot of mutual respect and humility there. Really great to see good riders/people winning. Great lead photo with the top 3 riders sunlit and the rest behind in the shadows. We question Sagan’s tactics but Trentin’s move makes even less sense. He could have won if he sat in there. Huge mistake in my eyes. Agree. Was probably spooked by the presence of Sagan though. Who knows. Had Van Aert not followed and dragged folks back, he might have gotten away, and then we’d all be calling it brilliant. Wouldn’t have been the first time a small bunch of favorites looked at each other while a winning move goes “too early”, (and this was quite the bunch of favorites). Like Terpstra at Roubaix. Hasn’t happened in awhile at MSR despite someone trying basically every year. WAs Cancellara the last? The small group that went over the top together was all class, world and national championship bands everywhere. Moment race was won: Sagan looking over his left shoulder for Valverde and Trentin when the action happend on his blind right where Mohoric started a ghost leadout for a non present Colbrelli setting up Alaphilipe instead. Excellent write up. I enjoyed the reference to the elusive early season soelden super g skier. Great race, thoroughly enjoyed it. Everything about it, the sunshine, the beaches, the palm trees, the gentle ease in watching the breakaway, Bonifazio’s lunatic attack on the Cipressa and then the always brilliant finale. It was very impressive for Alaphilipe to be such a resounding favourite, have such an obvious mode of attack and then still be able to pull it off quite comfortably. Such a long sprint after 300km was very impressive too. There were other noteworthy performances too. Valverde must be wondering why he’s left it so long to have a proper go. He almost did the perfect Valverde race. Never on the front, appearing in the final bunch at the finish. I was expecting him to win. Very impressive from Van Aert again too. He’s incredibly strong and will be a danger when he gets more savvy. Every time I watch him he’s the one closing gaps for everyone else. Also with Sagan – they say that there’s a massive difference in sprinting after 250km as opposed to 200. Maybe the difference between 250 and 300 is just as big. He’s the best in the world after 250 but always falls short here. Maybe he has to go so hard to stick with the lighter guys on the Poggio there’s nothing left for the sprint. Peter Sagan is ultra marked in the big races. He had blocked the left when he was looking right, but then the left side opened up and peter did move to protect it and it was over for him. Sagan should be less concerned about who is marking him and who is trying to take his wheel, and focus on his own race. He should never have put himself at the front anyway, but sitting up when he did was ludicrous. All he had to do was keep an eye on what all others were doing – maybe putting himself against the barriers, so they could only come from one side (beginner’s stuff). He had the sprint here, judging by how fast he finished after his abysmal start. Had he simply focused on going at the right time for himself, or following anyone else he’d probably have won. A stunning masterclass by Julian Alaphillipe and his team. I can’t remember seeing a classic raced so perfectly. Make the pace so hard the fastest sprinters are dropped – make the selection yourself – let the others make the pace – execute a perfect sprint. I missed the race due to attending a ‘small’ gathering in London. Sounds like a classic. Thanks for the great write-up inrng. I look forward to watching the highlights!! Nice recap on a good race. I watched from the start of the TV coverage (and wished again they’d show something of the Turchino, but) and was never bored. Looked like another Bicycle Racing 101 display by the Wolf Pack with the winner seeming to handle his favorite status with ease, at least until he burst into tears after the finish. I like this kid, he’s kind of a Valverde without the cheating baggage. Regarding the usual “wildman” “crazy” and “reckless” comments when it comes to anyone who knows how to descend well, Bonifazio’s a local boy – knows the descent like the back of his hand so none of those apply here, OK? Interesting that Degenkolb had issues with his gearing – will he rue the day the team signed with SRAM? I instantly thought about a few years ago with a guy on AG2R (don’t remember who and the video of the thing seems to have vanished) was kicking at his cranky front mech as the race went away from him or Cavendish’ tantrums when he was forced to use the stuff. If Nibali’s still talking to them about next year he ought to have it written into his contract they use something else. Mech kicker was Bardet, that was a few years ago. TdF stage on a mountain descent if I recall correctly. Sounds correct. I tried to find a video clip after seeing it live and I swear there was one, but last time I looked for it I couldn’t find it. Funny how they (and I don’t mean just SRAM) crow about race wins but get very silent (and defensive) when their equipment fails and costs someone a victory or high placing. And wasn’t Andy Schleck using SRAM during chaingate at the TDF? Although I seem to remember them blaming his use of larger than usual jockey wheels in the rear mech……..
You’re not wrong about Schleck dropping his chain, but the reference was to a AG2R rider specifically. Can’t say I remember the incident myself though. I’ve always found SRAM and Campag quite ‘clunky’. The Shimano lever shifters just seem so much more natural. The double flick for SRAM doesn’t allow for huge gear changes, should you need to whip through the gears and Campag’s little thumb shifter is problematic on the drops. I’m sure there are others who have opposing views. Then there’s the famous Wiggo “ghost ride” when his Shimano Di2(?) equipped bike let him down or a time or two Nibali has stopped to put his chain back on with both Campagnolo and Shimano. I’m amazed in some ways the ways the pros ride – just like the punters they seem to very often run the chain all the way over to the largest cog while still in the big chainring. Then, when they need a still-lower gear it’s BLAM! down to the small ring (quite often with compact chainrings) and then the over-stressed, crossed-up chain falls off to the inside, leaving them spinning away going nowhere or with a chain jammed between the chainring and chainstay. SRAM thought they’d be clever and do away with all this, but Degenkolb might argue their “solution” is worse than the problem – chain still falls off and you get only 12 ratios with large gaps between them. @ Larry T Eurosport commentator Riccardo Magrini said that Niccolò Bonifazio took every curve perfectly, being an ex-Pro his opinion really counts! I understand he was on a 1×12…..!!!!! Yep, get rid of the double chainrings since your front mech’s a hunk-o-junk, only to have the chain fall off anyway? Can you imagine the yelling going on in the Trek team bus post-race? Nibali better make damn sure SRAM’s not on the bikes when/if he goes there…or he gets an OK to use something else on a personal basis. Much easier to paint up a custom bike to match the sponsor’s team issue, but the components would be pretty obvious if they weren’t team issue. Equipment can’t make you win, but it can certainly make you lose. Is it true that the TNN riders are diabetic? Yes, and some of the staff too. That’s an amazing thing, as you wrote, to prove that you can ride 300km on highest competitive level. Thank you! Every time I watch Wout VA I am more and more impressed. A specialist in an 1h event getting a top 10 finish in a 300km race. This guy can do it all! Some laughable tactics by Sagan… everyone else was racing for 7 hours too. Sagan was the strongest sprinter on paper… should have won. On your armchair paper. Paper doesn’t win races. And that’s good. Unfortunate tactics by Sagan (again). He was outfoxed this time by Alaphilippe and 2 years ago by Kwiatkowski. At least in this race, he’s having a hard time balancing the pressure of being the most marked man with the tactical savvy needed to win. On Saturday, he sat up waiting for someone else to chase when he should have kept the pace up to respond to the inevitable attacks. Two years ago, he got stuck in front of two non-sprints (although they are both fast finishers). Maybe he was just gassed from a long day. Despite Alaphilippe being the favorite, it still seems as if it was Sagans’ race to lose. What I personally though was interesting, Quickstep did not apply their wolf pack tactics with throwing their whole team at the front attacking one after another until one gets through like in the opening weekend. They had one game plan and that was to deliver Alaphilippe. That was clear on the Cipressa as Gilbert was tasked to reel in the half-hearted attacks by the opposition. No foils, no nonsense. And the team and Alaphillippe delivered perfectly. I think the DS’s of the opposition must have nightmares by now. Another thing that makes me wonder… Gilbert is clearly in form again, but he sacrificed his own chances on the win for Alaphillipe, who is even hotter at the moment with seemingly no jealousy. I wonder why he never could function with van Avermart…? What is interesting, from my perspective at least, is that DQS’ “rocket-launcher” tactic on the Poggio was essentially just a refinement of Team Sky’s much-despised “mountain train”, distilled down into one-day form? Except that no one has called them out on it or criticised in any way. That’s why DQS are not unpopular despite their success – because it’s nothing to do with success and everything to do with the racing being interesting to watch. MSR is an anomaly: usually DQS’s tactics make races very interesting to watch. Really? You must have watched a different race. In the one I watched (live and a replay) Stybar was in the train with Viviani in the plan until he had to stop at the bottom of the Poggio (based on a post-race quote I read somewhere) and told the Wolf Pack to continue without him. I figure Phil Gil will get his chance soon enough? One thing worth noting is that Alaphillipe does reciprocate the respect given to him by his teammates – not exactly the greatest strength of GVA. A couple of good ones from last year that come to mind – Liege-Bastogne-Liege where he worked to protect Jungels by disrupting the chase group at the expense of his own chance at the win, and stage 16 of the Tour where he worked to set up a stage win for Gilbert. BTW there is no super-G race held in Sölden, only a conventional giant slalom.